Everyone is welcome to walk or ride! Participants must have a patriotic theme. Event sponsored by the Sophienburg Museum in coordination with the City of New Braunfels and the Parks and Recreation Department. Parade entries line up in the church parking lot of Saints Peter and Paul Catholic Church (Bridge and Castell Streets). To enter the parade, stop by the Sophienburg Museum for an application or download the application. For more information, please call 830-629-1572. 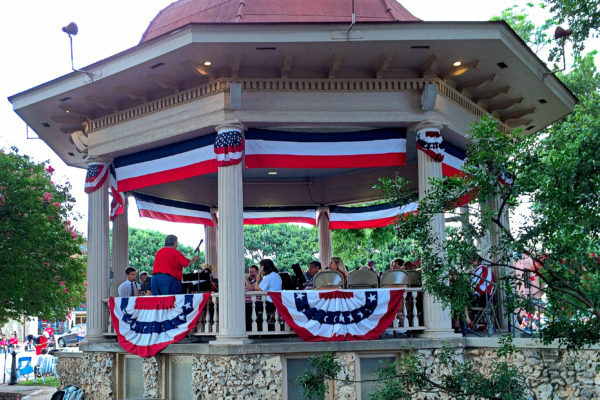 The Comal Community Band begins performing at the historic bandstand on the Plaza. Parade Route: Begins in the Saints Peter and Paul Church parking lot, goes down Castell Street, turns left on San Antonio Street, continues around the Plaza three-fourths of the way, turns right on Seguin Avenue (between the Courthouse and New Braunfels Coffee). Parade disbands after the Courthouse at Seguin Avenue and Mill Street. Parade vehicles and trailers are to turn left on West Zink Street to reach the Saints Peter and Paul parking lot. Entrants will want to quickly return to the Plaza for the program. Patriotic Program at the Bandstand begins as soon as the parade is over. The program traditionally lasts about an hour and has included the presentation of the colors, a welcome, an invocation, special music, remarks by New Braunfels city officials, a benediction, retiring of the colors and playing of the bells.